- NJPW Real World Tag League 1989 (November/December) = The Nasty Boys (Knobbs & Sags) competed in the league, which was won by Stan Hansen & Genichiro Tenryu. - WWF at Royal Albert Hall (October 3, '91) = The Nasty Boys defeated the Rockers. 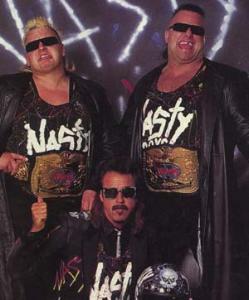 Later on, the Nasty Boys competed in a "Battle Royal", which was won by the British Bulldog. - WWF Survivor Series '91 (November 28) = The Nasty Boys & the Beverly Brothers won an "Elimination" Match over the Rockers & the Bushwhackers. - WWF Royal Rumble '92 (January 19) = The Nasty Boys competed in the Royal Rumble, which was won by Ric Flair. 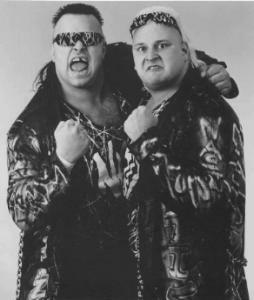 - WWF Survivor Series '92 (November 25) = The Nasty Boys & the Natural Disasters won a "Tag-Team Elimination" Match over Money Inc & the Beverly Brothers. - WWF Royal Rumble '93 (January 24) = The Nasty Boys competed in the Royal Rumble, which was won by Yokozuna. - WCW World War III '95 (November 26) = The Nasty Boys competed in the "WWIII 3-Ring Battle Royal", which was won by Randy Savage.